SFC Thanks Pennies from Kevan Foundation! Thank you to the Pennies from Kevan Foundation! Last week, Gary Isaacs and his daughter, Grace, from the Pennies from Kevan Foundation presented SFC with a check from the proceeds of their 2nd-Annual Homeless For the Holidays 5K fundraiser back in December. They even stayed to help serve breakfast that morning! The Homeless For the Holidays 5K, held at Griffith Park, was a huge success, with more participants than the year before. The proceeds benefited not only St. Francis Center, but also School on Wheels. Pennies from Kevan Foundation is a non-profit organization that provides funding to support the needs of homeless youth, adults and families in the Greater Philadelphia and Los Angeles areas. 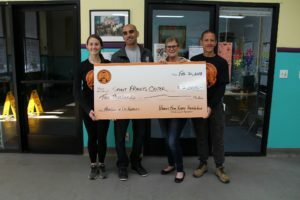 Thanks to generous donations from the Pennies from Kevan Foundation and our other supporters, we are not only providing hunger relief for our homeless guests but also case management to help them get on a long-term path to stability. We are in need of volunteers this week! If you are interested in Serving Hope, contact Corinne, volunteer@sfcla.org or 213.747.5347 x 111. 9th-Annual Friends of SFC Event ~ A Success! 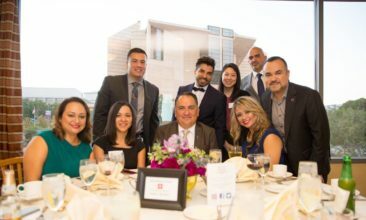 8th-Annual Friends of SFC Event A Success!